In Guinea, more than one third of the world's bauxite reserves can be found. Although rich in natural wealth, the people of Guinea are among the poorest in Africa. For many years, the country has been marked by political and social instability. SOS Children's Villages is helping vulnerable families children and young people in need. At present there are three SOS Children's Villages in Guinea, three SOS Youth Facilities, three SOS Kindergartens, six SOS Hermann Gmeiner Schools and four SOS Social Centres. Some facts about Guinea The Republic of Guinea is a country located on the Atlantic Coast of West Africa. It shares borders with Guinea-Bissau, Mali, Senegal, Sierra Leone, Liberia and the Ivory Coast. In the mid-19th century, French military occupied the area which then formed part of "French West Africa". SOS relies on the kindness and generosity of Canadians to be able to provide a home for the most vulnerable children of Guinea. 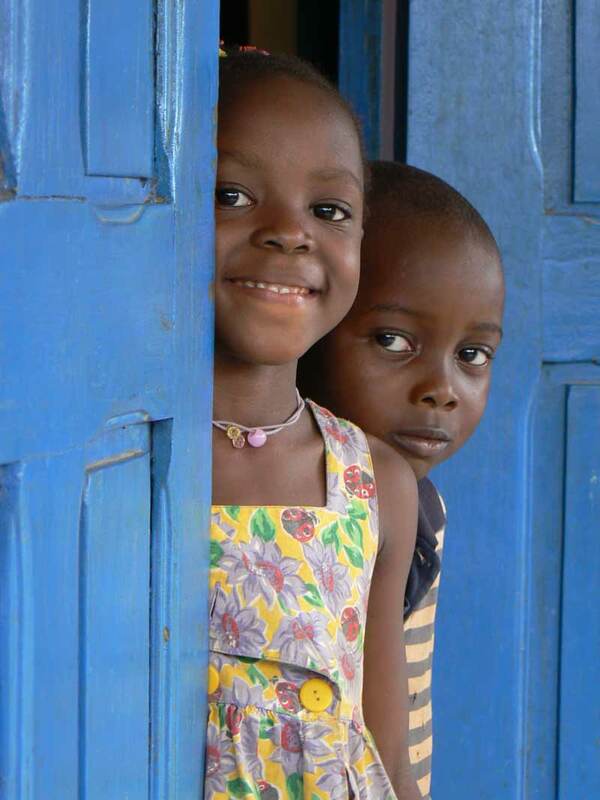 Please help us ensure a loving home for every Guinean child. Sponsor a child in Guinea now. The organisation started its activities in Guinea in the 1980s. In 1985, an agreement was signed with the government of Guinea and SOS Children's Villages received a plot of land free of charge. Civil war and political tensions in neighbouring Liberia and Sierra Leone led to an intensification of the organisation's efforts in the country. SOS Children's Villages has been supporting Guinean children and families in three different locations, providing day care, education and medical assistance. The organisation aims to strengthen families in order to enable children who are at risk of losing parental care to grow up within their own family. Children who cannot be taken care of by their own family can find a loving home in one of the SOS families. The current borders of the country were once negotiated between the French, the British and the Portuguese. Guinea gained independence from France in 1958 and proclaimed a free republic. Since then, post-colonial Guinea has since then been marked by long periods of authoritarian rule, political instability and repression. Following Guinea's independence, France withdrew completely and financial aid to the country was cut off immediately. A socialist agenda was introduced and strong ties with the former Soviet Union and Eastern European countries were established. Sekou Turé's one-party-state survived a number of attempted coups and ended with his death in 1984. Although the socialist experiment came to an end and the constitution was completely revised, poverty levels remained equally high. Guinea is home to at least one third of the global bauxite reserves and possesses vast agricultural and hydroelectric power resources that make the country highly attractive to foreign investors. In spite of Guinea's natural wealth, the country remains one of the poorest in the entire world. Foreign companies refine the bauxite abroad and Guinea does not earn as much as it could. As if dealing with its own economic and political problems would not be enough, instability in neighbouring countries has further aggravated the situation in Guinea. It received up to half a million refugees in the year 2000 as a result of civil war in Liberia and Sierra Leone, generating ethnic tensions and putting a strain on the country's economy. The on-going crisis in Côte d’Ivoire is now adding to Guinea's security challenges. The total population of Guinea is 10.3 million and the country's capital city is Conakry. Despite the fact that Guinea is a mineral-rich state, the socioeconomic situation for the vast majority of Guineans is rather alarming: Around 82 per cent of the population live in poverty. Access to basic services such as drinking water, sanitation and medical infrastructure remains difficult for tens of thousands of Guineans. In 2004, an increase in fuel and food prices and electricity shortages in Conakry led to mass protests. More than 100 protestors were shot dead during the demonstrations. With 16 per cent of Guinea's population already undernourished, rising prices for food may drive millions of Guineans to the brink of starvation. Access to education is a luxury only few Guineans have been enjoying: Guinea has one of the lowest literacy rates in the entire world: Only 29 per cent of adults know how to read and write. Among women, an incredible 82 per cent are illiterate. The gross enrolment ratio in education is only 49 per cent, meaning that the majority of young Guineans never get to see inside a school. The youngest segment of population is clearly the worst affected by the country's precarious socioeconomic situation. In Guinea, there is great need for increased investment in maternal and child health care. The country's infant mortality rate remains fairly high at 61 per 1,000 live births and thousands of births, both in urban and rural zones, are not attended by skilled medical staff. Many young children die from preventable diseases such as polio, measles, malaria or yellow fever. In Guinea, no cases of polio had been reported in years and now the disease has apparently returned to the region. 40 per cent of the children in Guinea are suffering from chronic malnutrition and roughly 26 per cent from weight deficiency. Although multiple campaigns over recent years have been launched in order to eradicate the problem of child malnutrition, the problem remains persistent in many areas of the country. 440,000 children in Guinea are growing up without their parents. An estimated 59,000 have lost parental care because of AIDS, a disease that deeply affects the lives of thousands of children. 9,000 children are HIV-positive themself. At 1.3 per cent, the county's HIV prevalence rate is lower than that of other countries in the region. However, HIV remains a major public health issue in Guinea.